RESOURCE CONSENT FOR STAGE 3 AT LAST - FUNDING NOW A PRIORITY. The Waikato Regional Council has now granted resource consent for Stage 3 of the Trail. The Trust has settled on a route that runs alongside the road from the Duck Creek bridge for about 200m before dropping down in the generous road reserve area. It will then pass through bush for about another 450m before turning back, through farm land, to the marginal strip by the river. It will then follow the river westwards for about 3km. The Trust is currently finalizing the design of the new Duck Creek Trail bridge and, with just a few outstanding matters to be resolved, is contemplating making a start on Stage 3 in the near future. Trust Chairman, Gary Fowler, says many hurdles have been overcome including the numerous bureaucratic demands associated with the process. All the Trail committee have contributed to the result but most of the credit must go to project manager, Andy Bolton (pictured) who has worked tirelessly over a very long period. Andy says obtaining a “non-notified” resource consent from the Waikato Regional Council has saved us a possible $80,000 in Environment Court hearing costs. We are in the process of finalizing the necessary concession from DOC for the river margin and expect to start construction of the Trail from Duck Creek to the river in the near future. But we will not be able to commence construction of the marginal strip section by the river until early next year. Our priority now will be given to raising the significant amount of money required to complete stage 3. You've heard about how the PAUANUI RAT & STOAT SOCIETY, hated being excluded, but fret no more, LIMITED DONATION opportunities has been opened for 2018! Initial donations for this cause will get the Donees name and a number entered onto a trap for ONE YEAR for the nominal sum of $250. This sum will be used by the Trust for the purchase of a GOODNATURE TRAP KIT and maintenance for ONE YEAR https://www.goodnature.co.nz Most important, each trap willl have a COUNTING DEVICE attached. For the following three years of financial support for the nominal sum of $40 per year - the Trust will use this money to fund one year's supply of LURE BAIT and ACCESSORIES. A small price to donate for twelve more months of fun and feverish competition. Trap owners don't need to train or reach pinnacles of extreme fitness in the quest for your team to win the ULTIMATE prize. Peter Millen, the Rat and Stoat Society TRAP MASTER will do all the hard work. In the event of a draw, TRAP MASTER will randomly select a winner (he can be bribed). Each month we will publish on our FACEBOOK and WEBSITE news pages, the RESULTS of the trap muster. NB: Rats, stoats, and possums will be encouraged to take part in this competition at NO FINANCIAL COST! The GRAND AWARD CEREMONY (move over OSCARS and EMMYS) will be held in Pauanui at the beginning of January (date and time to be finalised) and will include, a BBQ, good old fashioned games (which won't need a screen), and a BYO celebratory toast to the winners. Victory speeches will be limited to ONE minute. If you are not able to attend, you may have a stand-in read your speech. SERIOUSLY, we need EVERYONE'S support to get these pest numbers under control. This is a fun way to get children involved; they can see the difference their donation will make. 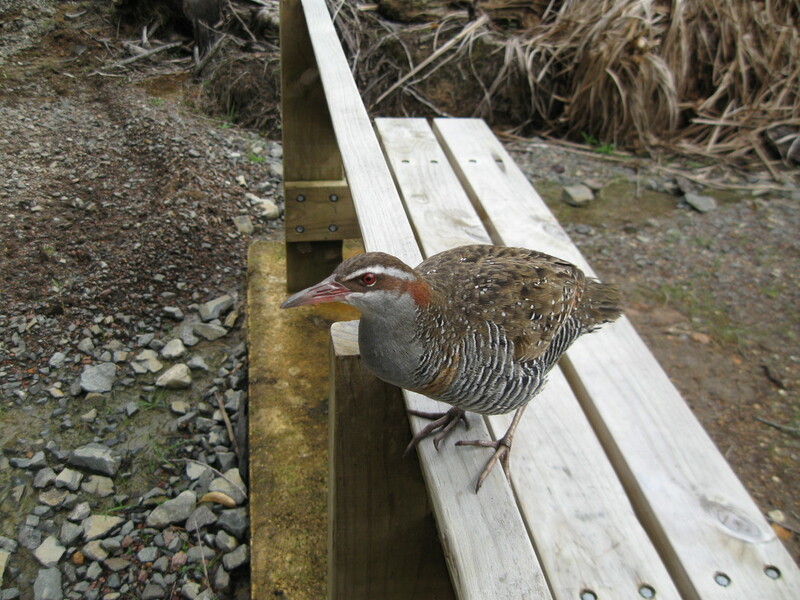 Over the last few years the tireless work of the PAUNUI TAIRUA TRAIL COMMITTEE members has seen an increase in birdlife as we get pest numbers under control; There is still a LONG way to go, and we need your HELP NOW. 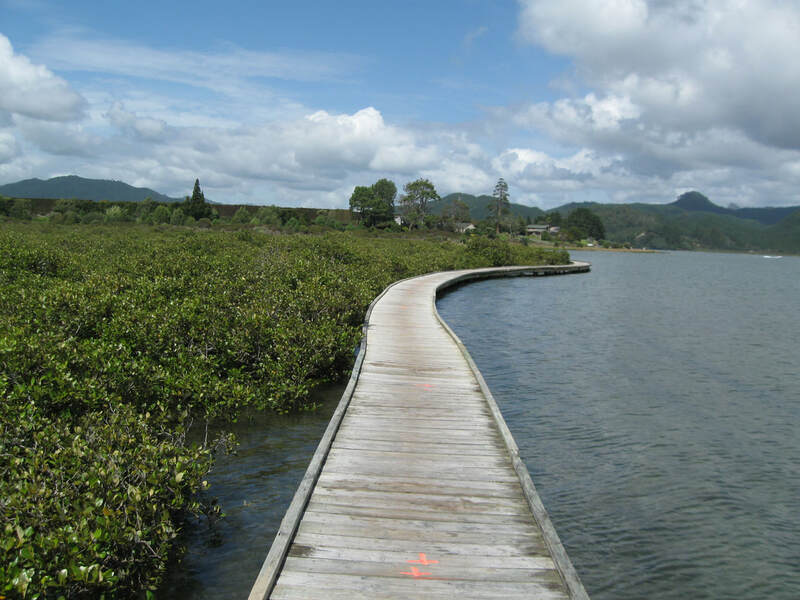 We can all play our part to get NEW ZEALAND PEST FREE by starting in our playground - the PAUANUI TAIRUA TRAIL. Westpac Thames 03 0458 0277108 00 Hikuai District Trust. All donations gratefully received and used for materials for the track NOW UNDER CONSTRUCTION. Please PROVIDE an email address or a phone number so we can ensure inclusion in our monthly updates and your receipt. Contact Jeanette with any questions. Don't just think, but ACT NOW! The 4th/5th January storm dealt the Waterways boardwalk a devastating blow. The Trail Committee is now desperate for funds to cover the $20,000 cost of materials and machine hire required for the repair. The considerable labour involved has been supplied at no cost. ​​The usual Trail Committee suspects set aside all other commitments immediately after the storm and together with a large number of enthusiastic and hard working local volunteers set to work. Within 5 days the boardwalk was temporarily fixed to the point it could be used. Previous repairs have generally held up well. The high tide, storm surge and large waves caused by strong winds proved too much, however, for some of the original structure. At least 30 new blade piles, with extensions will be driven in deeper than before. These piles should withstand even the tremendous pressure generated by the recent combination of adverse weather and tide conditions. We are looking for donations which might, for example, cover the cost of a blade pile (30 required at $500 each), a bearer (6 required at $100 each) or a wooden pile (8 required at $50 each). But any donation will be gratefully received. Donations should be paid to the Hikuai District Trust (a registered charity). "Spartacus" walked in from Tangiteroria Lane and then from the Ops area as, at 3 tonne, we could not risk getting it over the bridge at Tangiteroria Stream. This powerful machine devoured all in its path (see photo ). Our maintenance crew of Peter, John and I were filling in the holes left by the machine and also acting as safety sentries both in front and behind the machine to stop any trail users getting too close. It did an awesome job! work if we required it for free! Bob the Skid Loader is Earning its Keep. John McKenzie's love affair with Bob continues and he has clocked up a lot of hours so far. He and Peter MIllen have made some great improvements to parts of the existing Trail. Groups of other volunteers have planted a significant number of different trees alongside the Trail. One way and another Trail users can be expected to enjoy the Trail even more as time goes by. 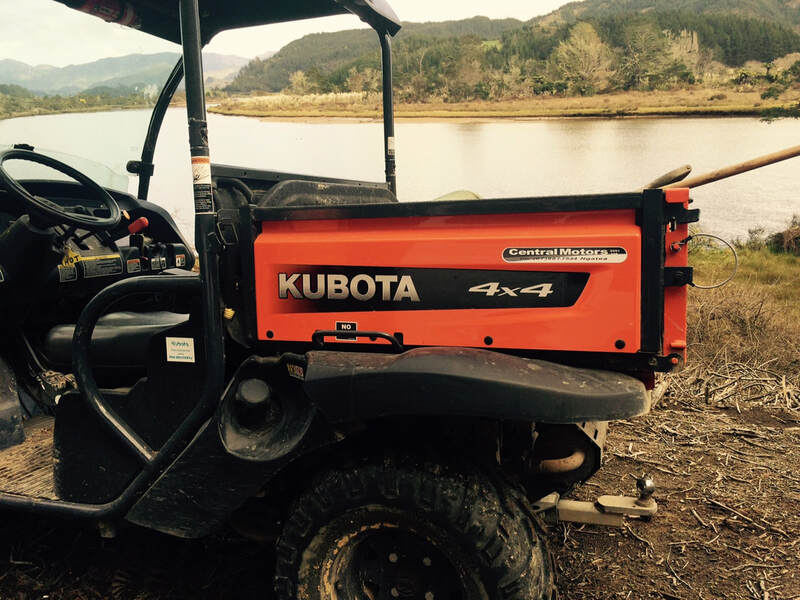 Our thanks again to the people who made Bob's purchase possible. ​Gabi Hunnker and Esther Salvisberg from Switzerland posed for this photo just past the southern end of the boardwalks this morning. They were going to take their time walking all of the Trail, stopping at the many picturesque spots along the way. Absolutely the best way to do it!